February is a great month to learn to love making your own wine and cheese! Bring your sweetheart to Curds and Wine to take advantage of our Valentine's Day weekend special: February 8th through 12th, purchase any two wine kits and pay half price vinting fee to make your wine on site at Curds and Wine (see details below). 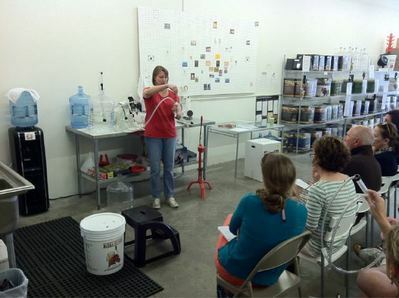 We'll even help you get started at our free Winemaking demonstration. Join us for our FREE winemaking demonstration where we'll show you just how easy it is to make your own wine, at home or on site at Curds and Wine! We will go through all of the basic steps of making wine from kits, from start to bottle. This will be an interactive demonstration, you will have an opportunity to take part in winemaking steps hands-on. This demonstration will take about 2 hours, and then you can start your own wine! There is no charge, and you can take advantage of our Valentine's weekend special following the demo (see below). Discover how easy and rewarding it is to make your very own wines! Valentine Weekend Winemaking Special: Make 2 Wines for Half Price Vinting Fee! From February 8th through February 12th, come in to Curds and Wine to make any two wine kits and pay half the regular cost for the vinting fee! Vintning fees for 2 kits are normally $150, this weekend pay only $75 for 2 kits; does not include price of wine kits, and you must start at least 2 kits to receive the discount. 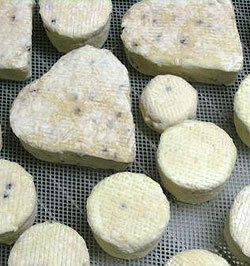 Make something really special for your Valentine -- a heart-shaped cheese! We have sweet little Couer a la Creme molds in stock so you can make your own heart-shaped cheeses to celebrate Valentine's day. Try it with fromage blanc or chevre then sprinkle with paprika, or our favorite, blue cheese! Follow the blue cheese recipe in our July 2011 newsletter, but ripen it at room temperature for 2 weeks for a faster ripening. In association with San Diego Amateur Winemaking Society, Curds and Wine will be hosting bi-monthly home winemakers' seminars. These seminars are held every even numbered month on the third Saturday at 1 pm. Seminars are given by Lum Eisenman, a winemaking guru that we are lucky to have in the San Diego area. Lum will share his expertise on various winemaking techniques and issues. This month Lum will give an "Introduction to Home Winemaking." Two more amazing Limited Edition wines will be released this month: California Petite Sirah/Zinfandel from Winexpert [SOLD OUT] and Erickson Farm Nebbiolo from Cellar Craft. We will email you when these kits arrive if you pre-ordered them already. If you did not and are interested in any of these special wine kits, please contact us, we do have a few extra ordered. Please note, these kits are for in-store pick-up only! Winemaker Magazine has the world's largest wine competition, entries need to be shipped to their headquarters in Vermont by March 16, 2012. Entry forms and more information can be found online . When shipping wine for competitions, package them well, in a wine shipping container if possible, and always send samples by FedEx or UPS, never USPS. If you win a medal in the Winemaker Magazine competition with a wine kit from Winexpert, they will give you a FREE wine kit equal to the one you won with! Other upcoming competitions include the San Diego County Fair, where one of our customers won Best of Show with his first-ever wine kit in 2011! Start planning your entries, we'll have more information in next month's newsletter. Happy Anniversary to Queso Diego! Last January, Chris Banker set up an online forum for San Diego cheesemakers. Within a few months a group of forum members met to form the Queso Diego Cheese club. Many congratulations to our president, Chris Banker, for getting us all organized! We also have an outstanding Vice President, Ringo Firefly, and an amazing Secretary, Anna Kearns, who "speaks cheese" fluently. Meetings have been very productive and tons of fun, with lots of homemade cheeses and other homemade goodies galore. Most members are just starting out making their own cheeses -- join us! Sign up for the email list online at quesodiego.org, and "like" the club's Facebook page to get updates on recipes and other cheesy events and discussions.